Talbot Bay is home to an entirely unique natural phenomenon that sees intense tidal currents hurtle through the Kimberley’s narrow coastal gorges to create an astounding sideways waterfall effect. Experience the world’s only horizontal waterfalls on a speedboat thrill ride or take a swim with friendly sharks (cage included). If you fancy a bird’s-eye view, Horizontal Falls Adventures offers scenic seaplane flights. Floating high above the MacDonnell Ranges in a hot air balloon, witness a spellbinding sunrise as bright rays illuminate the desert plains and its wildlife. Outback Ballooning, one of the oldest companies of its kind in Australia, operates out of Alice Springs almost every day of the year. After your sky-high wake up call, they’ll start your day right with an Aussie-style champagne breakfast. One of Australia’s most preserved reefs, Ningaloo also ranks as one of the best spot in the world to swim alongside whale sharks. Between March and August, around 300 to 500 of them gather along the World Heritage-listed reef to feed on plankton. These gentle giants share the waters with manta rays, dugongs, sea turtles, dolphins and tropical fish, providing an unparalleled opportunity for diving and snorkelling with Ningaloo Discovery tours. And from August to September, you can mingle with pods of graceful migrating humpback whales and their calves. A combination of two outback adventures, helifishing involves a scenic flight over the outback, with doors removed for unparalleled visibility and access to some of the best fishing spots in the Territory, unreachable by other modes of transport. For a chance to catch the region’s famous barramundi, Helifish flights tour the Top End for daytime or afternoon sessions, or even for a two- to five-day fishing adventure. An epic four-wheel drive adventure, the Binns Track winds all the way from the South Australian border to the remote northern township of Timber Creek in the far north west of the state. Traversing north for 2,230 kilometres, the track begins at Mount Dare and heads to the western fringe of the Simpson Desert, before journeying through the ancient East MacDonnell Ranges, abandoned gold-rush towns, the towering granite boulders of Devils Marbles and the famed “Barra country” of Judbarra/Gregory National Park. Unspoiled wilderness and sprawling wetlands teeming with wildlife define this special corner of the globe, and a safari here with Outback Spirit will introduce you to the Gove Peninsula of the Yolngu people and the ancient cave systems of Mount Borradaile. The company’s partnership with the traditional owners of the land means you might be lucky enough to be schooled by a local Indigenous guide, in the same way the Aborigines have been passing down knowledge for 50,000 years. Make like the early pioneers and explore the Red Centre on camelback. 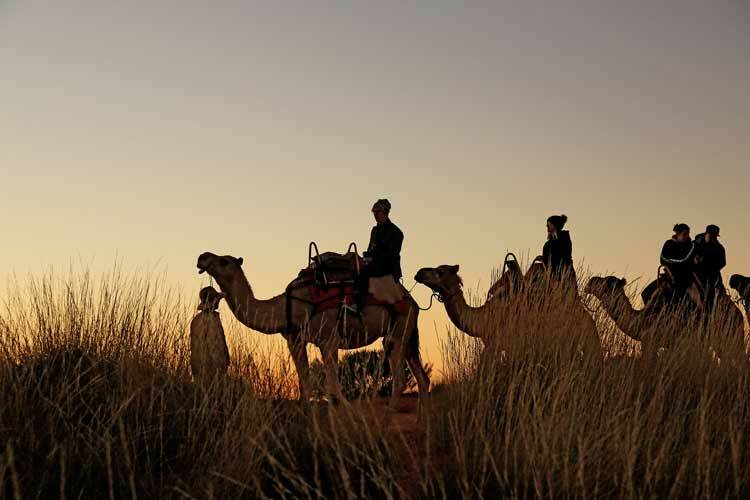 With 60 friendly desert animals in their care, Uluru Camel Tours offers journeys around Uluru-Kata Tjuta National Park. For an extra-special experience, choose between their sunrise and sunset tours to soak up the first or last light of the day against a rich, earthy landscape, before finishing with refreshments. The accompanying camel farm is open year-round and visitors are welcome to a short ride and a wander through the camel museum. Accelerating from 0 to 200 kilometres per hour in just 60 seconds, imagine rocketing in freefall toward the turquoise reefs of Rottnest Island. Western Australia’s only island skydiving experience begins with a 20-minute scenic flight, followed by an 8,000–15,000-foot plunge from the plane, with instructor in tow. Back on safe ground, be sure to take a selfie with the island’s ever-smiling resident quokkas. Further afield, Sky Dive Geronimo also offers tandem skydiving in Busselton and Broome.